Samsung is looking to expand its Bixby voice assistant platform across all of its consumer products, including white good, by 2020. The move is aimed at increasing its IoT footprint as well as its AI efforts. Samsung is expanding its Bixby voice assistant across its wider product portfolio, which includes bring the technology across to its washing machines, TVs and other white goods. It used CES last month to debut a smart fridge with Bixby on board, and it now has plans to bring a Bixby-enabled smart TV to the US next month and its first smart washing machines in Spring. According to a Samsung official, the company plans to load Bixby into all of its consumer products by 2020. The move is both part of Samsung’s wider Internet of Things (IoT) strategy, that will ultimately enable users to have remote access to their house and its various functions, as well as to boost its AI efforts. The company also hopes to accelerate its efforts in AI to help it better keep in step with its competition from Google, Apple and Amazon. According to Samsung, the more devices and users that are connected to and using Bixby, the more data that it will have to level up Bixby’s “intelligence.” The additional data points will help it to better understand and predict user behavior and language usage. 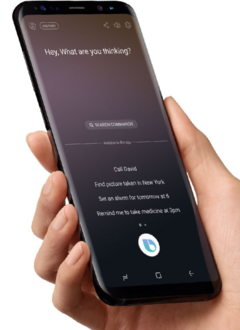 Although Bixby is built into Samsung's Galaxy smartphones, it hasn't yet rolled out to all of its major markets as the technology needs be specially tailored according to the language native to each market. Google, Amazon and Apple have far larger audiences that they can leverage to build their AI tech, but with Bixby everywhere, Samsung hopes to change the balance of that equation.